Java moss (Vesicularia dubyana, but it may actually be Taxiphyllum barbieri) is an aquatic plant from Hypnaceae family. This is a popular aquarium plant. It was named after Swiss plant biologist Dubyana. This plant is quite widely spread in amateur tanks due to its properties: simplicity and the fact that this moss is good as a spawning substrate for fish as well as its incredible decorative effect. 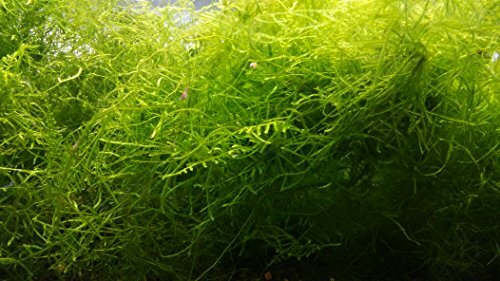 In the wild you can encounter Java moss in waters of South-East Asia (China, Thailand, Indonesia) which don’t get dry, have relatively clean water and slow flow. The moss is spread around Philippines and Sunda Islands. It came to Europe from Djakarta botanic garden on Java island which gave it its name. It was Java island after which the moss got its name. The plant grows on stones in a shallow depth near shores, on drowned snags and trees. You may also see this dark green Java moss on tree roots, stones and wet ground near water. The moss can get on shores using inshore plant roots and provided with almost 100% air humidity it can travel quite far. In the wild it uses spores for reproduction. At that it can grow them both under water and on the surface. The plant has a soft stem about 17 cm long which is thickly covered with small (up to 2 mm) green leaves. They are pointed and toothed; old leaves are darker colored while young ones are light green. The moss sticks to objects and surfaces due to its rhizoids – extremely thin fibers that consist of one or several protozoa cells which you can see only via microscope. By means of these rhizoids Java moss absorbs water and nutrients necessary for its growth. However, there is nothing special about it, since such a structure is peculiar to almost all kinds of moss and lichenes. Java moss is completely fuss-free aquarium hydrobiont, undemanding in terms of lighting and water parameters. Besides, the moss can grow without a substrate – on snags, stones and other surfaces. Its only demerit is its slow growth rate. If you expect a bunch of moss to grow twice as large in a month, an unpleasant surprise is waiting for you. Though, despite all its sloth-like pace of growth, the moss grows constantly and almost doesn’t stop growing if tank conditions change. Java moss has been kept in aquariums for quite a long time. When decorating a tank Java moss looks best on snags, large stones or pieces of flowerpots. You can decorate the back wall of your tank with Java moss by putting it behind the fixed large-meshed net. You can decorate the tank bottom in the same way. The plant is a very good looking one and its presence makes the whole tank decorations look more natural. Java moss looks especially good in small tanks. When it grows larger, it can completely cover the back and side walls of the tank. It’s better to choose large bunch of the moss for a tank, since the larger it is, the faster it strikes roots. Java moss isn’t demanding as for the quality and chemical composition of the tank water and it doesn’t require any special care. It grows better in old, but frequently renewed water with sufficient amount of substances that minimize development of lower plants. An important issue when cultivating Java moss is water purity and proper filtration. Dirty water with mud and suspended matter in it brings long and painful death for the plant. Don’t let food leftovers, fish metabolic byproducts and other rubbish lay and accumulate on the moss, because the plant pores get clogged and the moss won’t be able to breathe. To make sure that the moss looks healthy it’s better to keep cherry shrimps in a tank. For cherry shrimps a bunch of Java moss is the best place to live. They breed there and their juveniles can hide there from fishes and other tank dwellers. At the same time, for Java moss these shrimps are the best neighbors, because they constantly clean it from dirt and food leftovers. Green thread algae may appear in Java moss bunches in tanks with excessive illumination and it will be quite challenging to get rid of it in this case. This is when Amano shrimps become rather helpful, since they’ll eagerly eat green thread algae. One portion of Java moss for your freshwater aquarium. Lush green and healthy moss, great for shrimp and fry tank. May come with snails and snail eggs. Java moss easily stands water parameters change. So, it can be used as a spawning substrate for most of fishes. This kind of moss also acidifies water (which is important for Characidae fish), cleans water and absorbs lots of substances dissolved in it (even methylene blue), dirt also settles on the moss. Tank water temperature is set taking into account requirements of all other thermophilic tank dwellers. Java moss shows the best growth rate at water temperature from 70 to 75° Fahrenheit (21 to 24° Celsius). 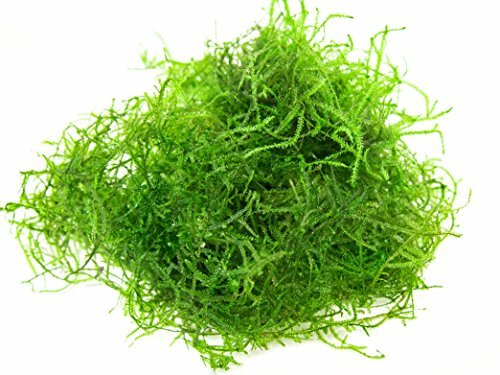 Java moss is also cultivated without water provided with high humidity level. Java moss doesn’t require any soil dressing mainly because it doesn’t have any root system. This moss gets all micro- and macro fertilizers from water. You can use some liquid fertilizers as extra nutrition for moss. Java moss isn’t demanding in terms of illumination, but excessive light can cause algae growth and it’ll be quite difficult to get rid of it later. The main principle when planting this moss is quite simple: you should fix the bunch to the surface and in time it will adhere to it on its own. How can you fix the bunch? Some aquarists just use a thin sea-line. You can tie the moss to a snag, stone or any other object, but be careful not to damage its extremely thin leaves. In a week or two, when the rhizoids stick tightly to the substrate you can carefully remove the sea-line. Thin natural cotton thread will also do for this purpose. You won’t have to remove it later, since in time it will rot and gradually dissolve in the tank water. It is a bit difficult to create vertical moss surfaces. If you need to create green background on the back side of your tank, you should tie equally-spaced moss bunches to a plastic grid and then put it vertically. This way of planting Java moss takes much more time. During the first week the moss grows very slowly, which is quite understandable: the rhizoids need some time for so called rooting. Approximately, in a week or two the plant will quickly grow on the substrate. Grows along driftwood, rocks, and other surfaces. Can be grown along rear glass for an impressive live plant backdrop effect! Does not need special or high intensity lighting - can be kept in any freshwater aquarium. Java moss is a rather widespread tank plant, which is completely not about its unpretentiousness or the fact that it doesn’t need any special care. Availability of plant material for implementing all your creative ideas in the field of aquascaping – this is what makes Java moss popular among aquarists all over the world.